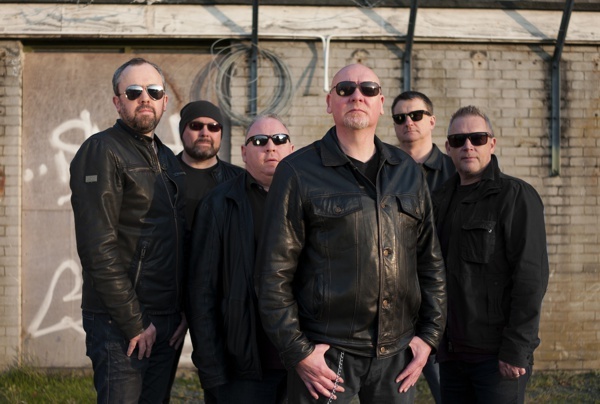 Belfast's No Hot Ashes were formed in 1983 and were primed and ready for a stellar career in Rock n' Roll. However, difficulties in getting their debut album released forced them to disband in 1990. After a one off gig in 2013 interest in band was reignited, resulting in support slots with the likes of Scorpions, Aerosmith and Foreigner. Now 34 years since their original formation, No Hot Ashes finally get to release their inaugural album. First of all my condolences on the passing of bassist Paul Boyd. The release of this album must be very bittersweet for you all. Very bittersweet. We are still devastated by Paul's passing. He was one of the original members and a massive part of the NHA family. Our only consolation is that he got to finish the album before he lost his brave battle with cancer. I know he was very proud of it and we are very proud of his input. I still get a lump in my throat when I hear some of his harmonies, it just catches me sometimes. The album is dedicated to Paul and to those that loved him. Last time I saw No Hot Ashes was in 2014 in Dublin supporting Foreigner at the famous Olympia Theatre. How was that experience? It was kind of weird. I have been a massive Foreigner fan all my life so it was a little daunting and exciting all at the same time. We had only just reformed to play a charity gig and the next thing we are sharing the stage with one of the biggest bands of all time. The Olympia is wonderful venue, it reminds me of the theatre in the programme The Good Old Days that I used to watch as a kid. Both the Dublin and Belfast Foreigner shows were very special gigs. The music industry has changed massively since you released your debut single 'She Drives Me Crazy' over three decades ago. Would you say they're predominantly positive changes? I'm not sure. Everything is very instant now. There seems to be a massive amount of product available and in many formats, which is great for choice. Bands have access to amazing home studios and Pro Tools type packages which means they can knock out material very quickly. Years ago there were a limited number of bands who would release one album per year. You would wait with baited breath for months on the new Whitesnake or Dio album; it just seemed a bit more special in a way. Today you don't need to leave the house to purchase an album, which is very convenient. However in the 1980s you had the joy and comradeship of visiting a record shop with like-minded people and spending hours choosing your next precious purchase. When we brought out 'She Drives Me Crazy' the only way to get it to the public was to sell it through specialist Rock shops or at gigs. My mum and dad had a corner shop and we sold it there! You could get a bag of spuds, a pair of tights, a cylinder of gas and our single all at the same time. If you spent over a tenner you got the record free. There was many a 90 year old woman slightly baffled when she emptied her shopping bag and a Heavy Metal single fell out. A sale's a sale after all. So to answer your question there are some changes for the good and some changes aren't so good. We will be using the good ones, like social media exposure, to our benefit when promoting the album. Your first attempt at releasing an album didn't come to fruition. Are there any songs on the record that were meant to be on the original release? When we decided to finally make an album it was quickly agreed that it would be a great idea to write completely new songs with a contemporary edge. Over the years we have all listened to a lot of different influences and I think those can be heard throughout the album. The new songs, to our ears, are fresh and alive and we have all contributed and collaborated in the song writing process. There are no egos here; the song quality is the most important thing. There is one song, however, that did make it from the old repertoire. Our drummer Steve Strange has always had a soft spot for the song 'I'm Back'. He was convinced that if it was recorded properly and given the production it deserves the song would be a cracker. Steve was right, he has a great ear and that is probably why he is such a success in the music industry. The song sounds immense and stands shoulder to shoulder with the new songs on the album. Tell me about the song writing process. Was it a collaborative effort? Our songs are very much a collaborative effort. Dave (Irvine, guitar) will come up with wonderful pieces of music and send them to me to write lyrics and melodies. I then take them to the rest of the boys and they add the colour and dynamics. Tommy (Dickson, keyboards) had written the music for one of the songs, 'Boulders', a few years ago. When he brought it to me I had been toying with the idea of writing a song about my mum and dad's struggle following her stroke. The music just fitted the narrative perfectly and is one of the highlights on the album. The songs I have started on my own would only sound as good as they do because of what is added by the other guys. Steve can dramatically change a song with a simple rhythm pattern. Niall (Diver, guitar) has a wonderful knack of adding licks that give light and shade. Paul wrote the music for one of the songs, 'Running Red Lights', and it is brilliant to have on there as a testament to his wonderful talents. Your hometown of Belfast has always embraced Rock music. What has the reaction been like in the city since the announcement of your reunion? Belfast during the 80s and 90s was starved of Rock bands coming here. I suppose you can't blame them really. It can't have helped when they were told by promoters, 'You will be staying in the Europa Hotel, the most bombed hotel in Europe.' Not exactly enticing. There were the die-hards that would always add Belfast to their tours like Motorhead, Rory Gallagher and Mamas Boys. For that loyalty these bands were shown loyalty and the Belfast Rock fans loved them. Due to the dearth of bands visiting, the local acts were embraced probably more than they would have been elsewhere in the UK. No Hot Ashes had a great and loyal following. Now that we are back in business they are all coming out of the woodwork and reliving their youth again. The response has been overwhelming. Quite humbling really. Just as we were completing the recording of the album Frontiers announced that we needed an acoustic track for the Japanese version. Paul and Dave said they had a cracking Country Rock song called 'I Will'. They let me listen to it and I thought that with a few lyric changes, I've never rode a horse ha ha, it would make a brilliant Rock ballad. We quickly recorded it with the help of the expert ear of Frankie McClay at Einstein Studios. The end result was great but we all agreed something was missing. NHA and Mama's Boys go way back, we have supported them over the years. Steve and Mama's Boys drummer, the late great Tommy McManus (RIP), even shared a house boat in Camden for a time. Tommy saved Steve from drowning on one drunken occasion, but that's another story in itself, ha ha. I have known Pat a long time. He is, in my opinion, probably the best guitar player in the world. What a lot of people don't know is that Pat is an all-Ireland champion on the fiddle. The Pat McManus Band are the hardest working band out there and they appear to be on tour year in year out. I put it to the boys that should we be lucky enough and catch Pat on a break I would ask him to play a lament on the fiddle over 'I Will'. I phoned Pat and he said he would love to do it but said he had a short window of opportunity to do so. A day or so later Pat travelled all the way from Fermanagh, where he lives, to Einstein Studios in Antrim with his trusty fiddle. He set up in the sound booth, and I swear this is true; he cut the track in one bloody take. It was perfect. I'm hoping that the song will be made available in some format and that it won't be solely for the Japanese release. Do you still have regrets over the way the band split in 1990? I was discussing this with Dave (Irvine, guitar) the other day and we agreed that there never really was an official spit as such. We all just moved onto different projects. Deep down I think we all knew that NHA was unfinished business. We just needed the right opportunity for it to happen. I don't think any of us have any regrets; in fact, our life experiences away from the band have given us grist to the mill of our song writing. We are just delighted that we all got back together again and were able to spend precious time with Paul. I think if that hadn't of happened then that would have been a major regret. What would represent a success with this album? Is finally getting it released the main thing and sales a bonus? Releasing your debut album 35 years after forming must be some sort of record and in many respects it is an achievement in itself. It is a definite reflection of our tenacity. So yes, just getting it out there is great but what's the point if no one hears it? I really believe in this album and I think the more people who buy a copy the better. Obviously in these days of downloads album sales aren't what they were but I still think a lot of Rock fans love the tactile experience of holding and enjoying the art work of a CD or slab of vinyl. And if we were to sell a million copies, well who would turn their nose up at that?